Ryan Model 7, tactical linerlock, partially serrated drop point blade. 4 1/2" closed tactical linerlock. 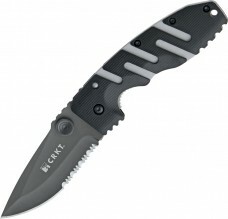 3 1/2" 8Cr14MoV stainless partially serrated modified drop point blade with gray corrosion-resistant coating. Blade features enlarged dual thumb studs which allow for positive opening. LAWKS safety. Black textured Zytel handles with zig-zag design for strength. Lanyard hole. Removable stainless belt clip. Designed by Steve Ryan. BRK Exclusive!